Why crude oil prices are up today: Oil surged above $60 a barrel today (Tuesday) after the Energy Information Administration (EIA) released a drilling report that included bullish signs for the future price of oil. By 10:50 a.m., WTI oil prices climbed 3.46% to $60.15 a barrel. The U.S. benchmark is on track to close above $60 for the first time since June 2. It has lost 0.1% so far this month. Meanwhile, Brent oil prices rallied even harder. They gained 3.64% to trade at $65.54 a barrel. The international benchmark is up 0.04% in June so far. 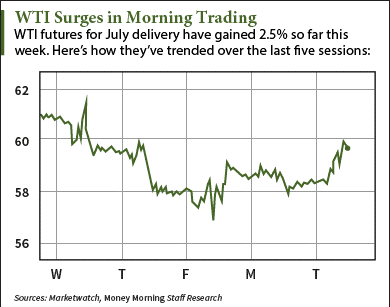 Today's oil price climb came after the EIA released its monthly Drilling Productivity Report. The agency expects daily oil production in the seven major shale regions to fall by 91,000 barrels to 5.5 million barrels in July. Output at the Eagle Ford Shale in Texas will see the largest decline of 49,000 barrels a day. The Bakken Shale, which stretches across North Dakota and Montana into Canada, will see output fall by 29,000 barrels a day. The report is first in line as both the Organization of the Petroleum Exporting Countries (OPEC) and the International Energy Agency (IEA) release supply data on Wednesday and Thursday, respectively. This week's barrage of supply reports will determine the direction of oil prices in the short term. But the long-term rebound has been underway for months now. WTI has soared 24.1% from its March 17 price of $48.48 – the lowest since 2009. "What's really driven our rally this year from our six-year lows is the idea that measures by North American producers are going to affect production levels by some point in the next three to six months," noted Gene McGillian, senior analyst at Tradition Energy, to The Wall Street Journal.